观点洞察 - Is Stock Connect the real deal? Is Stock Connect the real deal? In this insight, we review the status of Stock Connect. The low daily utilization hides the fact that Stock Connect has reshaped China investing. We look at who's buying what, why, and how much while also exploring where the program is headed. Since Shanghai-HK Stock Connect was first launched in late 2014, a lot of offshore investors switched to this channel to invest in China A-shares whilst Mainland Chinese investors began to utilize this program to invest in HK-listed equities. The low utilization of daily quota led to uncertainty about the effectiveness of the program. Both Shanghai and Shenzhen northbound daily quota is RMB 13 million each while Hong Kong southbound daily quota is HKD 10.5 million for both Shanghai and Shenzhen. Since inception of the program, the average quota utilization remained in single-digits, i.e. 3.8% for all northbound trades and 8.5% for all southbound trades. Specifically, northbound trades going to Shenzhen are higher than Shanghai, and reverse in southbound with Shanghai taking the lead. These statistics miss the real growth, however, as they net buys and sells. The picture looks dramatically different when aggregating buys and sells and the progress is in fact quite encouraging. 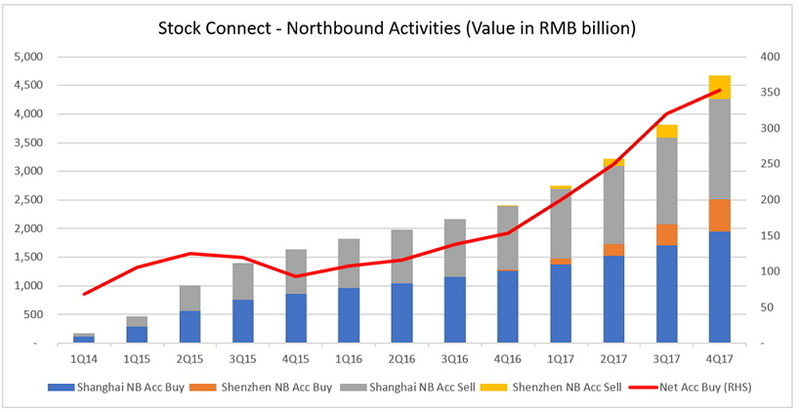 On the northbound, trading interests accelerated in 2017 since the introduction of Shenzhen-HK Connect and the announcement of A-share inclusion from MSCI. In terms of value, the overall trading activities were RMB 2,265 billion in 2017 versus RMB 771 billion in 2016, up 194% year-on-year. Shanghai’s trading is still higher, but Shenzhen’s is catching up rapidly. The red line below shows only one net selling period, the second half of 2015, when foreigners stepped back during the onshore market correction. Since then, the holdings of A-shares via Stock Connect picked up and kept rising, reaching RMB 353 billion at the end of 2017. On the southbound, the interests of Mainland Chinese investors in trading HK-listed shares also sped up in 2017. In terms of value, the overall trading activities counting both buying and selling were RMB 2,260 billion in 2017 versus RMB 836 billion in 2016, up 170% year-on-year. As shown by net accumulated buys (below), the holdings of HK-listed shares went up steadily in the past few years and reached RMB 727 billion at the end of 2017. 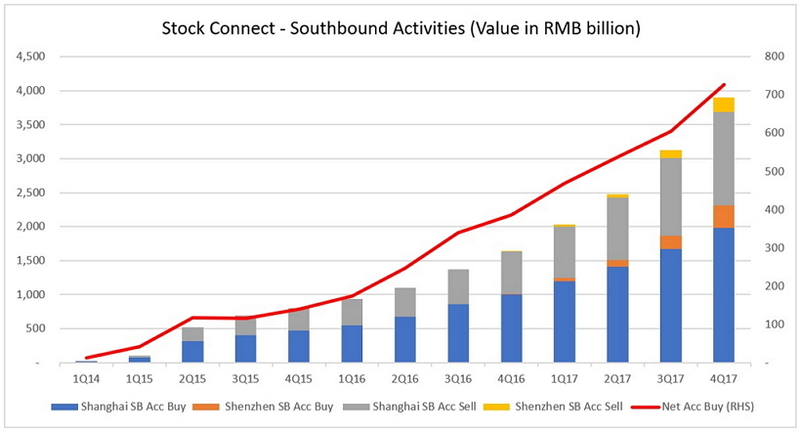 The freeze in QDII quota likely pushed mainland investors toward Stock Connect, making Southbound holdings twice as large as Northbound. The top positions of both Northbound and Southbound investors offer interesting observations and implications for future market returns. Offshore investors are more interested in unique A-share exposure that is not available elsewhere, e.g. Kweichow Moutai, Jiangsu Hengrui or Hangzhou Hikvision. Out of the top 10 positions in both Shanghai and Shenzhen, only 3 are dual-listed stocks. The other 17 stocks are only traded in either Shanghai or Shenzhen. Mainland Chinese investors are less interested in foreign stocks. HSBC and Tencent are of course there, but many investors are aiming to take advantage of the price difference in Chinese dual-listed stocks. Of the top 10 positions in Hong Kong, half of them are H-shares trading at discount to A-shares, such as China Construction Bank, ICBC and New China Life. For industry preference, offshore investors are relatively diversified with a priority on consumer discretionary, followed by financials, consumer staples, healthcare, IT and utilities. On the other hand, Mainland Chinese investors focus on financials overwhelmingly, comprising 8 out of the top 10 positions. Going forward, we expect interest in China equities, including both Shanghai-/Shenzhen-listed A-shares and HK-listed shares to carry on, resulting in higher trading activity and total share holding via Stock Connect. Northbound activities will benefit from the inclusion of A-shares, stabilization of renminbi, strong macro and corporate earnings. Similarly, Southbound activities will be supported by Mainland Chinese investor diversification into offshore markets. Strategy wise, taking advantage of the price difference in dual-listed stocks is likely to decrease in popularity. 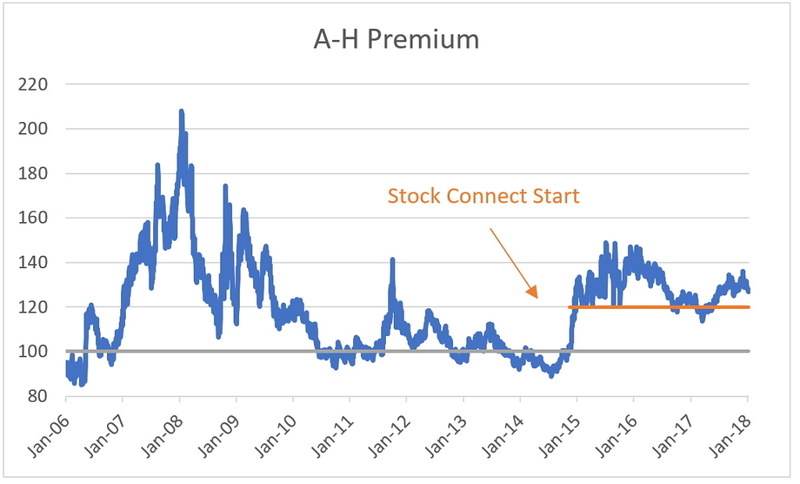 A-H conversion on the back of Stock Connect alone is not yet on the horizon, as evidenced by the premium remaining above 120 continuously since Stock Connect inception. Investors will focus instead on niche exposure not available in their respective markets. For Northbound investors, that means consumer discretionary and staples, IT and healthcare stocks in A-shares. For Southbound investors, it will likely be multinational companies and Internet plays in Hong Kong. Stock Connect will be the likely route for this continued investment, given its ample capacity, easier operational requirements and lower costs. QFII and RQFII will continue to be used by the largest investors, but most will slowly switch to Stock Connect. At Premia, we made the move from the start, becoming the first Stock Connect only A-shares ETF provider on HKEx. 2803 HK and 3173 HK keep their total expense ratios low with the help of Stock Connect. Future product launches by other providers are likely to follow suit in utilizing this innovative program. Whether they pass the savings to investors remains to be seen.